Boy and Rick accompanied by FishSiam team member Ow venture to the mighty Maeklong River in Western Thailand. With the tidal river at maximum height and the light just beginning to fade a slow but steady take indicated that some twenty metres below an unseen monster had picked up our ledgered deadbait! A forty minute battle ensued with the unseen leviathan clamping onto the bottom on several occasions requiring the anglers to reposition the boat in order to re-apply pressure from different angles! Finally after an epic battle the prehistoric fish boiled angrily next to the boat, expertly the Giant Freshwater Stingray was brought into the boat by Ow, Boy and Sa as Pak expertly held the boat steady in the raging currents of the main flow. 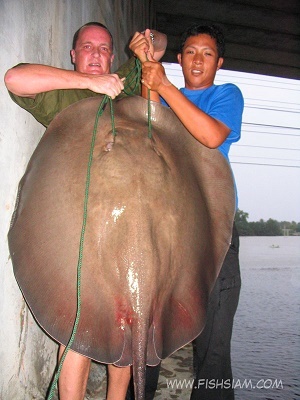 The monster ray was quickly transported to a nearby bridge where it was photographed and then safely released. An estimate of 60 kgs was placed on the fish which was identified as a female. With the giant freshwater stingray somewhat resembling some form of extra terrestrial being and the rapidly increasing amount of alien encounters we had experienced in this area it was decided that this stretch would be christened Area 51.